A few weeks ago, Windsor Circle was acquired by OSG. There’s a tremendous amount of validation in this moment. My band of warriors started a journey seven years ago at great risk and peril. No incomes for a year or two. An idea on a napkin, that turned into a team, that turned into a beta product, that morphed into Windsor Circle, a leader in Predictive Marketing Platforms that raised $15MM in Venture Financing and won Google Demo Day to national acclaim. We’ve been working on a fascinating problem… reducing data and data science to push button simplicity for the marketer. Over our 7 year journey, we’ve made a ton of progress and have learned a lot of lessons, the two most important of which are Product Marketing Fit, and Leverage. I’ll tackle these two subjects separately. I often get asked about product market fit. What is it? How do you know you have it? Once you have “it” then what? My current working definition for product market fit is “virality.” We spent a lot of time at Windsor Circle doing client satisfaction surveys, and polling for NPS scores, etc, (FWIW, NPS scores turned out to be one of the strongest correlated measurements to renewal/churn). But I think at some level the notion of product market fit is simpler. The real question is “have you built an offering (product/service/whatever) that your customers can’t wait to talk about?” I stumbled into this realization a year or two ago with two different product offerings. The first product is Slack, the messaging app. Honestly, I’m still not 100% certain that it made our lives better at Windsor Circle. In essence, it moved internal email communications out of gmail and into a new instant messaging paradigm. While it fit our frenetic societal mentality of instantaneous and omnipresent communication, it blew away some long standing cultural adaptations around email (for example, using the email inbox as a to-do list). It created yet another place to have to look for institutional knowledge. But the fire-and-forget format of chat is alluring, and both our sales team and our engineering team had spun up instances and were absolutely in love. They professed this fascination far and wide… and people throughout our organization jumped in. As leader, I finally had to declare that our value of “Single Source of Truth” was being threatened and that we needed to go all in or get all of the way out. Fearing a complete mutiny, we switched to Slack and made clear corporate guidelines about communicating wholly in Slack for internal discourse and wholly in email for external conversations. The lesson here, despite my obvious reservations, is that Slack was on fire. Everyone was talking about it. Everyone was recommending it. And their adoption (and valuation) has gone through the roof. The second is Scott’s Cheap Flights. The power of this product is its simplicity and the value it creates. In a nutshell, you sign up to be notified of when an airline drops its prices on certain routes. It’s as simple as that. There are no sponsored deals… no gimmicks… No clickbait. He (Scott, presumably) finds when routes go on sale, and emails it to the list when they do. And I’ve told everybody I know about it. We saved $2,000 when eight of us (two families of four each) to Spain last year. We’re saving similarly on a trip to Montreal this summer for 11 of us. What’s interesting about this offering is it’s simplicity. You can’t go to the site and search for deals. It doesn’t have gizmos and widgets and data science thingys. It’s just an email a day. It shows you where the deals are. It characterizes some insights like “we think this deal will last for 24 hours”. It has a button that preloads a google flights search with that deal in it. Super, super simple. And super, super valuable. First things first… if you’re creating exceptional value in any form, people will be excited about it and share the good news. If you’re not seeing that virality, you need to work on the product and how your target audience consumes it. We definitely had a phase at Windsor Circle where we scaled the sales effort on the back of an initial product market fit, and it lead to churn. We had PMF for innovators but not for the mass market and it caused us a ton of pain because we scaled into the mass market before we’d truly achieved PMF for that segment. Simply put, the innovators solved for some product deficiencies through creativity and hard work. The Mass Market wants the “easy button.” That’s not a knock on the mass market. It’s a reality check that you have to solve for PMF in phases. What could we have interpreted better about these early signals? We were good at asking for referrals and getting quotes. We took that as the signal that we had PMF. A much better indicator would have been a high flow of inbound, unsolicited referrals. In another way of saying that, our strength in sales and marketing masked a product market fit problem that really only expressed itself once we were in the mass market and started seeing churn due to non-usage. We’ve corrected a lot of those deficiencies, but only after some harrowing times (a strategic pivot upmarket, a restructuring that cut into a team that I loved dearly, etc). There’s a completely separate issue here, and that is having enough dollars to innovate against a hard problem long enough to get PMF. That doesn’t meant that we (I) should be let off the hook for making good strategic decisions… but there is a reality that if you’re tackling a really hard problem, it may take more time and dollars than you realized when you took that first angel round. I’ve got a few more posts worth of thoughts about this… to be continued. I was doing some research for a client and assembled some data about the prevalence and growth of various forms of digital usage that could be easily quantified. Sharing some basic data here, but I found a couple of items notable. 1) Email usage is the largest, and still growing – This surprised me. I was under the impression that email was stalling out and that all of the other platforms would overtake it. This data would suggest differently. Email is still very much alive. This would confirm the feeling that a lot of us have that we’re not replacing, but augmenting the number of places where we can (or have to?) access data and interact with people. 2) Instagram is growing much more rapidly than other platforms – Everyone knows that Instagram is growing rapidly, but the rate of sustained user growth is notable. Check out YoY growth here…. Instagram is projected still be at 10%+ growth as it ends 2017. I’m not going to wax philosophic here and try to interpret the trends. I just found the data interesting and thought I’d document and share. And here’s my Google Spreadsheet where I compiled the simple data. Feel free to poke around, make a copy, etc. We have a core set of values that we are pretty rabid about. We talk about our values all of the time. They’re painted on the doors. We give people awards in our Team Meetings for being the best at exemplifying the values. It’s a big deal for us. Volunteer in Childhood Education in Durham – We have made long term commitments to Crayons2Calculators, Book Harvest, and Healthy Start Academy, and every quarter we send the entire team out to humbly serve these organizations as they strive to help at risk youth in Durham. Science of the Team – Human relationships take work, so we spend several hours on each Team Day working on a specific item, like “How to Have Difficult Conversations” or studying our Myers Briggs profiles together. Funishment – Oh, and we like to drink beer and arm wrestle. That definitely tends to bond people together. I should know better than to challenge Henry, who is 20 years younger than me and has some pretty big guns. Look at those things. Just sayin’. During Science of the Team yesterday, as a group we did the “Lost at Sea” Survival Simulation and collected the results. Basically, you’re lost at sea and have to rank 15 items in order of importance to helping you survive the ordeal. You do it first as an individual, then in small groups of 4 people, and then you compare your individual rankings and your team rankings to the rankings of experts from the Coast Guard who theoretically would know best how to survive. Team scores — achieved by deliberation among members, according to the rules of the game — were better than the average of individual member scores for 15 of the 16 teams; the exception also had the worst team score of all. The mean team score was better than the mean individual score and its standard deviation was also lower. This means that teams both improve the rate of survival and reduce the risk. A summary table of scores is below. The score is the sum of the absolute difference between an individual or a team’s ranking of the 15 items and that of the experts at the US Coast Guard. Lower is better (meaning your rankings were less different from that of the experts). A density plot of the observed scores is below. Again, lower scores are better, and note how the team scores are significantly lower than the individual scores. The “curvy” lines are the standard deviations. Basically, you are more likely to conform to a good score if you are in a group. As an individual, you are more likely to be all over the map. In essence, working in teams both increases your performance, and your likelihood of a good performance. If you can reduce risk and increase return… man… that’s a ringer. Do more of that. At Windsor Circle, we define team not by who is on the payroll or inside our four walls, but truly by everyone who is working to build the Center of the Retention Automation Universe. This includes our employees, our service providers (attorneys, accountants, landlords, etc. ), interns, and most certainly our investors. We have worked hard to find investors who share our values, see the same opportunity that we do, and who could add far more than just their dollars to our efforts. The Two Day Board Meeting… What the? Believe it or not, we hold a two-day board meeting every other quarter. We do this because we want to unlock the collective experience and insights of a talented set of market makers, and feel that you can’t do that with an 3-hour board meeting where all you are doing is giving updates. We do a financial call two weeks prior to the meeting to get all of the updates done, and to provide 2 weeks of time for the board to think about the data. Team Building – We make certain that our entire team is interacting with one another. Investors, associates, and management team members meet, socialize, share ideas, and solve problems together. Click here to download our full agenda for this last board meeting. Speed Dating – We needed to help our investors get really deep on the opportunities for both expansion and improvement, and we wanted to expose them to a larger number of our team members, so we created a 3 hour Speed Dating experience. We had 6 stations, each staffed by 2-3 associates who took them deep on a particular part of the product or the go-to-market strategy around the product. They had 20 minutes to listen, learn, take notes, and ask questions, and 10 minutes to transition. In 3 hours, each investor had rotated through all 6 stations in an intimate setting, with the opportunity to directly observe our company and our product for all that was good (and not so good!). Executive Dinner – We made sure that there was time for the investors to build relationships with the management team, and even kept it super healthy (salads and light fare). Texas Hold’em Tournament – That evening, we put away the work stuff and had an all hands poker tournament. It was a ton of fun to watch a total of ~35-40 engineers and investors, marketers and management, sales and client success all squaring off in a fun game of Texas Hold ‘Em! Executive Breakfast – This was a second opportunity to deepen executive and board level relationships. We made it optional, but everyone showed up. While the dinner the night before was more social, this was a little more structured around strategic conversation and digesting information learned during the Speed Dating sessions. Investor Panel – After the board meeting and lunch, we held another all hands session, this time in the format of a town hall / panel style interaction. 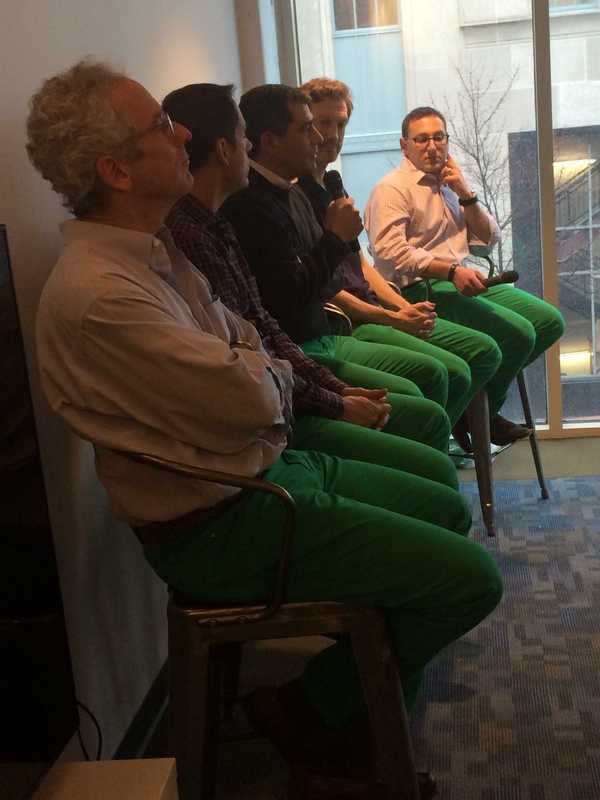 The investors (now all clad in Windsor Circle Green Pants!) sat up front, with the entire company in the room. We instructed our company that no question was taboo, and likewise instructed our investors to pull no punches. Openness and Transparency is a key value for Windsor Circle, so these instructions were well heeded and we had a fantastic and honest conversation as a cohesive team about what the market looked like, what opportunities and threats Windsor Circle has, and what lay ahead for us as we continue our very rapid growth as a company. People Helping People – Opportunity to Pitch to Our Investors – We sought commitment from our investors in advance to spend time with fellow entrepreneurs in our ecosystem here in Durham. We basically created the opportunity and then got out of the way, so our peers could have direct access to our investors to pitch. We understand that this was well received by both sides! One of the Best Board Meetings! All of our investors reported back that this was one of the best board interactions they’d had in a long time. Here’s a quick quote from one of our investors. (Sidenote: I share this quote not to be pretentious, but rather of evidence that this calculated risk regarding the extended meeting format met with the results we’d hoped for). If you’d like to download the board agenda for more specific details, click here. Goof off a bit at Bull McCabes, our favorite watering hole. In this last science-of-the-team session, we enlisted the services of Duke Corporate Education, and specifically the talented Executive Director, Leah Houde. Duke CE (located right here at the American Tobacco Complex in Durham, NC) typically coaches CEOs of F500 companies, and has been named by Financial Times as the best corporate education group in the world for 12 years running. (Yeah, wow… mad props). The gap here is palpable. If the CEO isn’t actively listening and creating opportunities to get closer to the inner voice, she or he has a real problem. The employee is rightfully showing enthusiasm and support. The CEO is hearing agreement and buy-in. But what’s really happening here is that the employee is feeling really scared about the change that is coming. Here’s another example, from Leah’s presentation. Mind the Gap – Just be aware. We all have that little voice inside our heads keeping a running commentary of our lives, but if there’s a gap between what’s being said aloud and what’s being thought, you could have a serious disconnect. Create Room for Inner Voices to be Heard – In the short term, this could be providing for truly anonymous surveys or feedback mechanisms. In the long term, it should be continuing to make deep deposits into the emotional bank accounts of employees and earning their trust over time. The more genuine vulnerability and earnest attention to people’s opinions you can show, the more the gap can shrink, because people feel that they can trust you. Remember, the bigger the gap, the bigger the problem. Work hard to listen for that inner voice. This is a big one. Inside our own minds, we have years of context and conditioning. We are masters of our own data and experiences. So when we act, or make a statement, we do so with all of that context… in other words, we intend to communicate a certain sentiment with the words we choose, based on what we know. But this is problematic, because the person you are communicating with may not share your context. They may not know what you know. And so the impact of what you are saying may miss the mark. In this exchange, the prospective hire is equating profitability with job security. The CEO of the startup is excited about not being profitable, because in a high-growth, SaaS business model, if all of your other metrics are right (CAC, margin, churn, and growth rates) the last thing you want to do is slow down and try to get to profitability. The explosive growth and lack of profitability, to the CEO, is a sign of rampant success! In this scenario, the CEO would have been better served to ask “Great question… Are you asking about the nuances of our SaaS operating metrics, or are you more concerned about our success and survivability as a firm?” This would have aligned intent before the impact of a grandiose statement scared off this prospective hire. Remember that your intent is tied to your own contexts. Ask clarifying questions early and often when communicating so that the impact is what you wanted it to be. Argyris (HBS) and Schon’s (MIT) Ladder of Inference is a construct for understanding how we as humans frame perceptions based on data that we have. We observe data (bottom of ladder), apply reasoning based on our experiences and knowledge (middle of ladder), and then come to a conclusion (top of ladder). We as humans evolved over millions of years to get to conclusions very quickly… and that’s healthy. Those who couldn’t quickly surmise that fast things with large teeth were likely to eat them, were removed from the gene pool. Those who could quickly arrive at this conclusion (“Danger! Run!”) passed along this hard wiring to their progeny (us!). So… relax. It’s healthy that we quickly and automatically form conclusions. We just need to be aware of them, especially when our conclusions are causing conflict. Using the prior example, the CEO is working from a data set that is framed by years of executive experience in SaaS. She has seen scores of examples of high growth SaaS businesses produce significant wealth by specifically not trying to achieve profitability, but instead by focusing on growth within the right SaaS metrics. The prospective hire on the other hand, may have been a part of businesses that failed because they were poorly managed, did not have access to funding, and did not achieve profitability (self sufficiency)… and as a result felt real pain when they were laid off. In other words, these two participants are talking about the same thing, but working from different data, processing that data in different ways, and ultimately reaching different conclusions that are in conflict with one another. What’s useful about this paradigm is that it lends itself to a phrase that can be invoked when you are in conflict or disagreement with someone. I started using this phrase, “walk me down your ladder,” almost immediately in our business and to good effect. Yes, it’s a bit cheesy. Yes, it feels a bit “corporate” to say “walk me down your ladder.” But the benefit of clearly signaling that you care enough to try to understand the other person’s perspective, and that you’re willing to risk some cheesiness and business-speak to do so, is well worth it. We are targeting significant growth in 2015 at Windsor Circle. We held a company wide meeting and specifically invoked these themes. We acknowledged the inner voices of our team, who have largely not been in venture-backed, high-growth start ups before and who have not seen this sort of aggressive growth in their early careers. We then literally used the words (because everyone was trained on them), “let us walk you down our ladder so that you can see what the management team and the investors see, and then we welcome you to draw whatever conclusions you’d like from that data and reasoning.” Certainly our hope was that our team would see what we see, but our goal was to align, not necessarily to convince. Given the Windsor Circle core values of “openness and transparency,” and “facts, not claims,” we showed specific numbers to our entire team regarding the funding that we’re putting to work to make these growth goals a reality. We showed how dramatically we’re ramping the product team, and the investment in the marketing team. We showed comparison charts of how much more we’re investing in marketing spend and in which channels. It doesn’t mean that people immediately snapped out of their own conclusions… that would be a silly expectation on our part as a management team. But by earnestly listening to inner voices, thinking about our intent and impact, and using the framing of “the ladder of inference” we shifted the conversation away from the fear of the unknown, and over to a reasonable discourse of why all of the data suggests that this is the right time, and the right team, with the right resources, to get this done. We just ended December at 151% of our best month to date, and Q414 at 142% of our best quarter to date. We’re three weeks into January and we’ve already beat December. We’ve got a lot of wood to chop in 2015, but I think we’re headin’ in the right direction! Thank you, Leah and Duke CE, for being a part of our journey. These are invaluable tools and we appreciate you helping us learn and leverage them. We spent some real time thinking about how we would approach compensation as a team now that we’re post-financing. We wanted to maintain the discipline that got us to where we are, but also do a good job of executing on our values around taking care of our most important resource… our people. Here’s where we landed (see below). This now lives on our internal wiki so that all employees can get to it and so that we can all hold ourselves accountable to it. In the same way that having clearly articulated our Windsor Circle Values (and trying to live by them), I think that this will help give us a “true north” when thinking about compensation. At Windsor Circle, we want people kicking the doors off the hinges to be here every day. Part of making that a reality is giving people a fair financial compensation package and equity ownership in an exciting, high-growth company. But money isn’t the only thing. There are lots of places where you can make a lot of money and be miserable. We don’t like miserable people, and don’t want them on our team. We want hungry, ambitious, positive, fun, kooky people (and so far, that’s exactly who we’ve attracted into the Center of the Retention Automation Universe!). We want people who love being here because it’s a meaningful place to be, with team members they really like, and extraordinary opportunities for personal growth. Fair compensation – We actively document data points externally and internally and purposefully aim for the 50th percentile of the market. Equity ownership for everyone. This is rare. We want everyone rewarded if we exit big. This isn’t about making everyone a millionaire (that’s an incorrect expectation to set). This is about sharing in the rewards if we get the job done and have a nice exit. Loyal Citizens, Not Mercenaries – We want employees who are passionate about “us” and our mission (as “we” are hard to replicate!). We don’t want individuals who are primarily or solely motivated by high compensation (as the highest bid is somewhat easy to replicate). We seek loyal citizens, not mercenaries. Find Diamonds in the Rough – We’re willing to take chances on smart, unproven talent. In the first year, an inexperienced employee can expect to take a lower salary in exchange for being given significant mentoring, responsibility and experience. Play to our stars – Our stars can expect higher compensation. Not everyone can be a star, but the smartest, hardest working, most committed team members will earn special compensation for their contributions. Optimization, not just Balance – To be clear… we’re a venture-backed startup. We’re not out for a nice stroll every Sunday… we want to win the Superbowl. Expect to work ridiculously hard. Expect to hit heights you didn’t think possible, and to be exhilarated and exhausted as we celebrate our victories. Like an elite athlete, expect to be supported in ways that make you soar. Building the Best Team Requires Letting Low Performers Go – Everyone’s outcome is dependent on performing well in every role, and if we can’t help an underperformer course correct, then we must have the courage to amicably part ways. When we do so, we hold the respect and integrity of the individual in the highest regard. Quarterly Bonuses That Reinforce Relationships – Every quarter, we name a bonus for the entire team when we hit certain revenue targets. These aren’t financial rewards unto themselves. They are things that draw us closer as people. If we hit really big goals, then we additionally provide an opportunity for employees to engage their friends, family, and loved ones with a cool experience. Insurance and Benefits – We will look to have a competitive health plan, with a focus on making employees healthy and well. We will also emphasize value to the employee. In this time of change in the healthcare environment, this means that we will leverage tax advantaged ways to deliver value, such as Health Savings Accounts. We’re a smart bunch. Doing a bit of thinking can add more value to our employees instead of taking a dumbed-down but more expensive standard plan. Retirement savings and other long term financial incentives will be considered as well. No Substitute for Ownership and Fair Compensation. Foosball and free sodas are poor substitutes for fair financial compensation and ownership in an exciting, growth-oriented business. Doesn’t mean that we won’t have fun. And we’ll very likely have free soda. But we won’t confuse the fact that our employees’ well-being, and that of their families, are of paramount importance to them. The nice-to-haves are just that. Nice to have. Wow your top 10%. Excellence is hard to find. Once you’ve found it, secure it. Risk * Execution^2 = Reward. We’re building a world class software as a service company. As a startup, we need people taking risks. The more risk one takes, the more reward is embodied in the upside. That said, we must execute against our plans to mitigate the risks, or the reward will never materialize. So, risk times execution squared will be the lens we peer through as we think about financial compensation for members of our team. Tim Oakley, CFO of Appia and former CFO of iContact, is one of the Triangle’s best entrepreneurial executives. With multiple exits and financings under his belt, and a commitment to servant leadership, we are fortunate to have him mentoring and guiding a generation of entrepreneurs (like me!) in the Triangle (the New Entrepreneurial Hub of the South). Tim also formally does executive coaching at the Carolina Clinnic at UNC. As Windsor Circle goes through the process of selecting and hiring a Director of Finance and Operations, Tim offered to spend some time with me thinking through strategy and candidates. The first section is Tim’s “5 R’s of Finance.” The following sections come from a scoring matrix that Tim shared with me. I’ll use these subject areas to frame this post. I’ll also offer suggested questions in italics to expound upon the areas in which one is qualifying a candidate. This is a framework Tim shared with me for how to think at a high level about the G&A function. I reframed it slightly to address how one hires in this function. Radar – Candidate has the systems, processes and management reporting that show issues early to be addressed and to capitalize on opportunities. Reality – The candidate must collaborate with company leadership to define what the REAL story of the company is through monitoring metrics and relational and market information, and seasoning it with judgement and wisdom from her/his experience. Relationship – The candidate has to be able to built a trusted connection with the executive team and team members. This is especially true with the 15%-20% of the leadership team that is really driving the business (likely, but not always the CEO). This section is from Tim’s scoring matrix, with elaboration based on our conversation. This seems obvious but Tim pushed me here a bit. There’s a difference between financial planning and modelling, and the act of closing the books on a routine basis. Part of this is knowing how to handle accounting complexities in a subscription revenue business (such as deferred revenue schedules). Another part of this is testing for the discipline to logically order a complex set of tactical requirements and keeping those trains moving on time. Tim shared that at iContact, he outsourced the bookkeeping function for quite a long time to a contract accountant. Describe your experience closing the books and presenting financial statements to investors. During the last audit, what did you find to be the most frustrating about the process? What did you do to manage through it? Imagine you’ve earned the job at Windsor Circle as Director of Finance and Operations. Take 5 minutes to whiteboard your monthly, quarterly and annual responsibilities and then walk me through how you will manage it. Here, Tim was coaching me to think about the outflow of cash in one’s organization. Getting everyone paid on time, and knowing how to manage vendors and contractors (and their payment terms) are critical skillsets, particularly during the early trajectory of a company given how crucial every dollar is. Describe an instance where payroll was mishandled and what you did to overcome the error. What is your philosophy on payment terms and how to pay vendors? In the past, when faced with a cash shortfall, how did you manage AP to get the desired result? What was the desired result? What payroll systems do you have direct experience with? If you earn the job here, what would you change about our current payroll system? Clearly, this is the inbound cash function. In most businesses, these are payments from customers, but can also include payments from partners in the form of revenue sharing, commissions, etc. As we scale from hundreds of clients to thousands of clients, with varying contract terms, and potentially across various products with different product and service profiles, this can get complex. Tim wanted me to be sure I understood how someone in this function can keep a tight rein on the very source of life… one’s inbound cash flow! Describe the system you have used in the past to manage your client ledger. How have you handled collections. What critical measures do you use in this function? How will you know that you are collecting cash well? (Days Sales Outstanding, or DSO, is key metric that should pop up in the answer). I’m actually combining two sections here from Tim’s scoring matrix. What (I think) I learned was that Tim was wanting to dig into a candidate’s ability to run the technology that runs the function. CRM systems like Salesforce.com or NetSuite allow one to keep all recorded interactions in a single place. (At Windsor Circle, we strive to a corporate value of “Single Source of Truth” in our CRM and actively work to get everyone communicating through a single platform). As he worked me through the IT systems component, he seemed very focused on the interface between the payment systems and billing technologies (at iContact, it was built into the customer facing app and required a pretty light implementation of QuickBooks to manage… in other companies, the contracts and billing process are paper driven and may involve much higher degrees of complexity in the IT systems). What CRM systems have you used in the past? What complexities have you witnessed in the interactions between the CRM systems and the billing technology that you used in your prior roles? Let’s say you won the position here, and had to completely revamp our CRM and billing systems… whiteboard a plan for how you would tackle this and walk me through it. An audit will be handled by an outside firm, so this line of questioning has more to do with how to manage an audit or review process. Have you led an audit before? What criteria is most important to you in selecting an audit firm? What support systems and resources are required for a proficient audit? This is kind of a yes or no question. Either the candidate has a CPA or not. The knowledge you’re looking for here is an authoritative level of expertise with regards to Generally Accepted Accounting Practice (GAAP). This, too, is a skillset that can be contracted in, but having someone inside your firm with a CPA provides for a level of efficiency, not just in audits, but in the general running of the finance function. A key indicator of expertise in this area is deep financial modeling capabilities. In our selection process, we put one of our candidates under NDA and had her/him dig deep into our existing model with recommendations and analysis. If the prior functional areas have to do with the tactical aspects of running the business, this subject area has to do with the strategy of running a business. One must quickly be able to model various scenarios, answer what-if statements, and think about future metrics assuming various aspects of the model come into being (or don’t!). I’m going to have you sign an NDA, and then provide you with our financial model. I’d like you to hit hard and pull no punches in preparing the 5 top things you’d modify about our business and our financial model. In your opinion, what are the hardest parts of the financial model to get right? Whiteboard the major aspects of your financial model and talk me through interdependencies. Deep expertise here is usually a CFO-level function. Managing the complexities of due diligence and deal terms, as well as bringing the implied trust and connections of one’s personal network, are core aspects of this functional area. If you’re hiring for a manager or director, exposure to these skillsets would be a plus, but perhaps not a requirement. If you’re hiring for a CFO, they are a must. Have you been through an acquisition? Please describe the scenario and your role in it. Describe your experience with fundraising? What are the merits of venture debt versus equity? Educate me on the terms that I’m likely to encounter in the market? Have you ever been on a team that did an IPO? What was that like? What did you do well? What did you do poorly and how did you overcome that? When Tim hit this area, it became clear to me that he was borrowing from a fair amount of intuition from years of experience. What he seemed to be looking for was a candidate’s ability to rise above the noise of the function and sense what was happening in the business and to be an active participant in the prediction of what would happen next. This also has to do with savviness… sensing what’s happening in the team, in the market, and in the ecosystem. I perceived here too that deep business acumen was either an indication of a rising star or someone that had been around the block a few times. Describe where you see SaaS, as a concept or an industry, evolving to in the next 10 years. Describe a hunch or a prediction in your current role that came true. How did you communicate that hunch? When it came true, describe the reaction of your peers? You’ve gotten to know our business. Make 3 predictions and back them up. Rapid Growth Company – There’s no doubt about it… the fast pace and ability to make decisions in the absence of data points is a critical ability. Executive Team/Board/Culture/Communications – One could describe this as a test of anyone coming into the organization, but given that this person has to interact with a range of stakeholders on a variety of important topics from hitting revenue targets, to “zero cash day” to payroll, it’s important that you select someone that will fit well. Tech Industry Experience – For us, one of the key aspects of this vector is Software as a Service subscription revenue concepts. Wants The Position/Hungry/Something to Prove – Again, these are good things irrespective of the role. In the finance function, I’ve now seen a couple of scenarios where a FP&A (financial planning and analysis) person from a large firm was actively seeking are more generalized role in a startup. The hunger for the exchange of risk for higher responsibility, greater title and a more diverse set of learning experiences is critical. Size of Company – Related to high growth, but different in that a small company requires everyone to wear lots of hats, and usually in a very unstructured environment. In small companies, everyone has to be willing to get dirty and get the work done. Candidates from large organizations may say they value this freedom and flexibility, but if their resume reflects only large company experiences, dig deeper here. Managed and Led People Human Resources – Tim really pushed me here. One of the candidates that we considered hadn’t managed others before. This function has to manage both internal and external stakeholders to do well. He asked me several times about my confidence that our lead candidate could step into this capability effectively, or if we’d run into issues with inexperience on this front.